Why He’s Top 40: For treating magic like an art form and sharing his enthusiasm with hundreds of children every year. At the age of 11, Sheldon Casavant was spending a lot of time in the magic section of his local library. Like many children, he was intrigued by the idea of magic lying beyond the surface of everyday life. 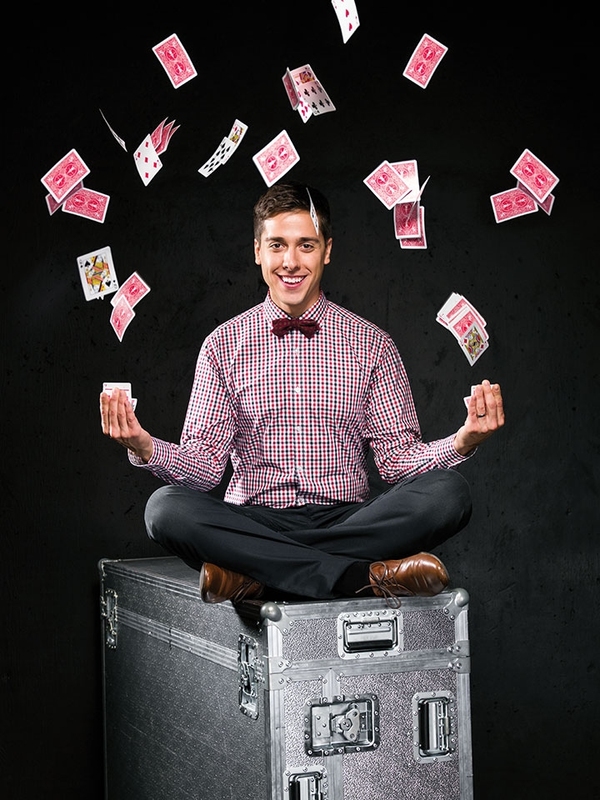 One day, a professional magician, who was also researching at the library, noticed Casavant’s interest, and showed him some tricks using elastic bands. The illusionist became Casavant’s mentor, and that’s when the magic happened. “I felt like I was a real magician who could do real magic. So, 11 was kind of the turning point psychologically,” says Casavant. He put on his first magic show that year in his parent’s living room. Family members came, as did a local reporter who wrote the story about Casavant. It resulted in paid performances at birthday parties and company events throughout his teenage years. Casavant hasn’t stopped performing since that day in 1997. The difference is, now Casavant is a mentor to many other children as he performs at schools, encouraging kids to embrace reading. While Casavant’s backstory reads like a children’s story – fitting since he wrote it as such in a book called Morton the Magician and his Magnificent Magic Show – he takes his work very seriously and it’s evident in his success. For a year, he performed seven days a week at a hotel in Japan for up to 400 guests. At one point, he did 414 shows consecutively. He’s had so many adults and children ask him about magic, that he created an instructional DVD and co-wrote a book, along with hypnotist Wayne Lee, providing some literal tricks of the trade. But, to him, magic is an art form, cultivated over years of practice. One of his newest shows that he performs at corporate conferences was two years in the making. “For my performances, I want to have that element so that it’s more than just: ‘Want to see a trick?’ I want to engage the audience emotionally, or comedically,” he says.